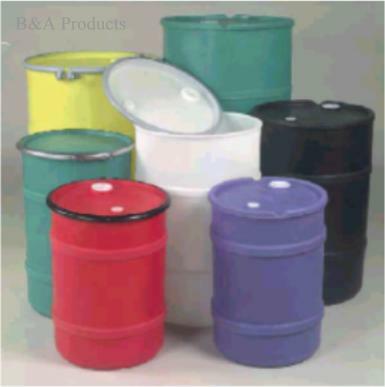 Durable seamless drums have 0.190" sides, 0.140" top and 0.130" bottom thinkness. Rustproof and dent-proof, they're ideal for outside storage. Drums are stackable and easy to handle. Closed-Head Drums are supplied with one 2" NPS and one 3/4" NPS bung. Open-Head Drums are supplied with bolted steel locking ring and plain cover without fittings. Leverlatch rings and covers with fittings are also available, see below.